Hello Katie Girl: Happy Valentine's Day! In honor of Valentine's Day, I am wearing everything I can that relates to it! First and foremost is my heart skirt. Originally, I was tempted to buy this almost identical J. Crew heart skirt but I realized that I already had a similar one hanging up in my closet! Second is this adorable button down that spells out "Love" because hearts and love, obviously, go hand in hand! Last, but not least, are my cute heart shaped sunglasses. This pair was under $10 and are quite reminiscent of a more expensive version that you may have seen on some blogs. Normally, I'm not opposed to spending money on sunglasses (I wear them a lot!) but for trendy ones like these, I'm fine with opting for the knock off version. So while I'm going all out with this Valentine's Day look, one thing is for sure: my husband and I won't be going out for Valentine's Day Evening! This is perfectly fine with me because I would rather stay in than go out for dinner and deal with crowds! In fact, there's nothing better than a romantic home cooked meal on Valentine's Day, even if I'm the one cooking. Last year, we tried to order takeout and that proved to be a disaster that involved both my husband and me standing in line and waiting for our food with a bunch of other angry, disgruntled customers for over an hour. This experience only confirmed my instinct that it's best to stay in on holidays! So, no matter what you're doing on Valentine's Day, even if you're spending it alone, I hope you enjoy it and have a delicious dinner, be it dinning in, taking out, or eating at a fancy restaurant. Beautiful Valentines Day look! I love the mix of patterns! 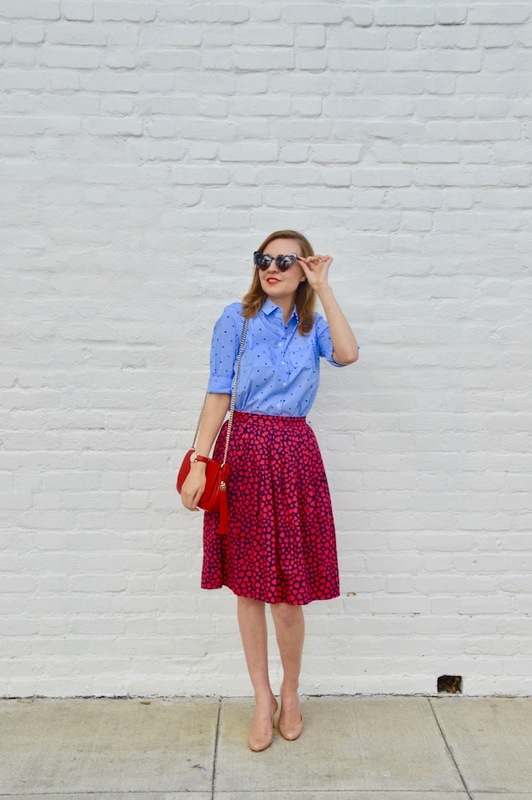 The love print on your shirt is such a fun touch with the heart print too. 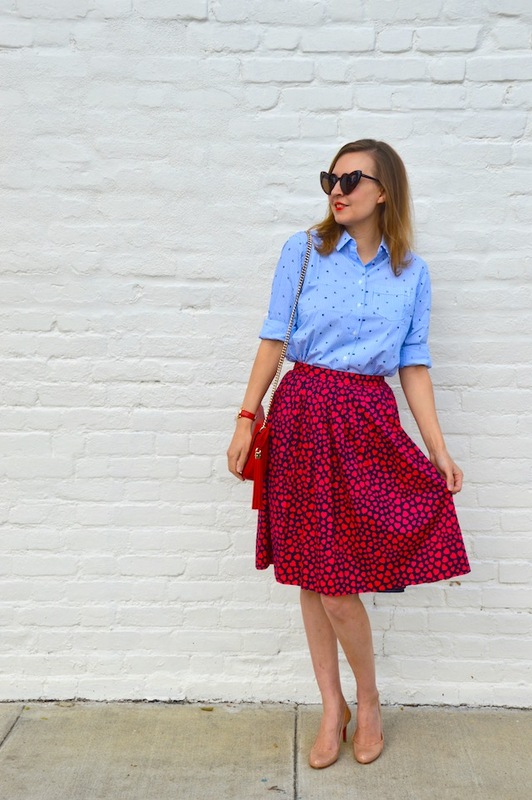 You always have the perfect items and outfits for every occasion and holiday, like this gorgeous heart skirt and that preppy and adorable love-print button-down. As a matter of fact I think I need the shirt and sunglasses since they are so affordable. Love the red Gucci, too. I agree about staying in, on actual Valentine's day. It is a mess and food takes forever, plus some fancy restaurants up the prices.